Being the foodies that we are the Mason Jar Mamas are always trying new foods. So I figured we could start Food Review Friday. Some of the most amazing foods can come from the most unexpected of places and today is one of those days. 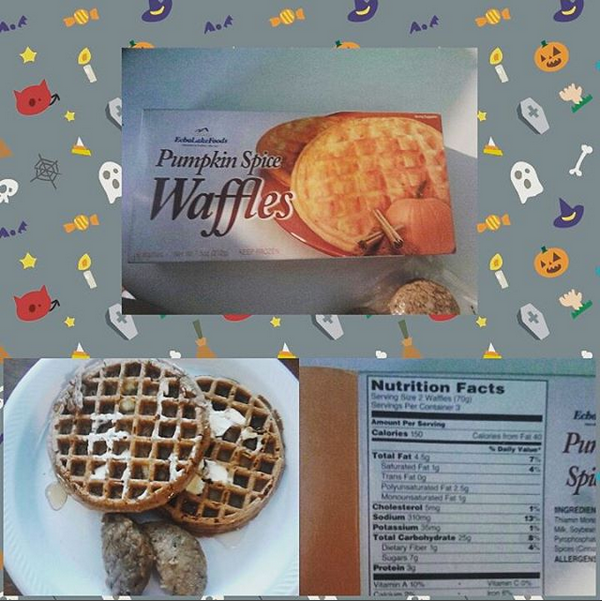 Yesterday while browsing my local Dollar Tree, I stumbled upon these Echo Lake Foods Pumpkin Spice Waffles, and me being the I LOVE ALL THINGS PUMPKIN fan that I am, I just had to have them. They sat in the freezer from the time I came home til I woke up this morning calling my name. They were to be my breakfast. Not expecting much from dollar store waffles, I opened the box and was very pleased with the color and scent of these pumpkiny breakfast treats. Into the toaster they went and the scent of fall filled the kitchen, as I removed them from the toaster I could feel the warmth and crispness as I put them on my plate. Topped with a little butter and some syrup (although it didn’t need either one, I could have just eaten them plain) and served with a sausage patty it was a delicious change to my usual morning yogurt. At only 150 Calories in 2 waffles these were a great option for me as I continue my weight loss journey. I’m thinking you could also make one as a snack and top it with cookie butter, or even just some plain ole peanut butter if you want. Or maybe a festive fall egg sandwich? Any way you decide to eat them Echo Lake Foods Pumpkin Spice waffles are sure to make your tummy & wallet full and your taste buds happy.